Spray 5-quart slow cooker with cooking spray. In 12-inch skillet, cook bacon over medium heat 6 to 8 minutes or until crispy. Transfer to paper towels to drain. Crumble bacon; cover and refrigerate until ready to serve. Pour all except 1 tablespoon drippings from skillet. Add onion; cook about 4 minutes, stirring occasionally, until tender. Transfer onion mixture to slow cooker. Stir in broth, milk, broccoli, potatoes, carrots, pepper and salt. Cover; cook on Low heat setting 5 to 6 hours or until bubbly and potatoes are tender. Increase to High heat setting; stir in whipping cream. In small bowl, beat cornstarch and water with whisk. Beat cornstarch mixture into mixture in slow cooker. Cover; cook about 15 minutes or until thickened. Add cheese cubes to slow cooker; stir until melted. Add Cheddar cheese; stir until melted. 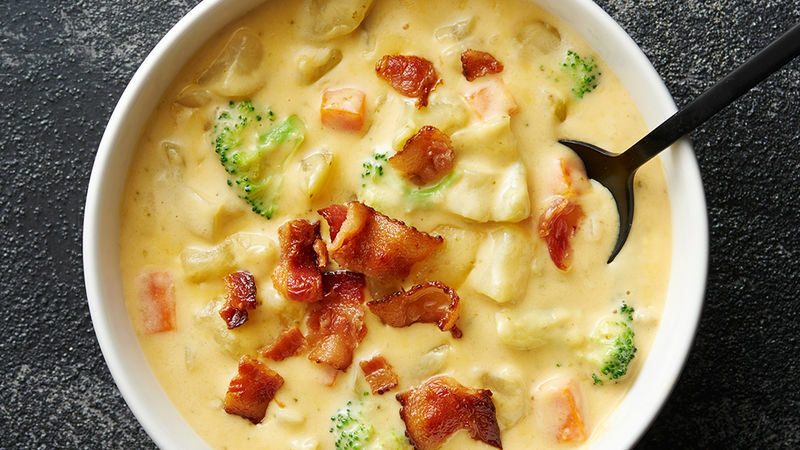 Serve chowder with reserved crumbled bacon as garnish. Cheddar cheese comes in a variety of types from mild to extra sharp. If you’re looking for a less intense Cheddar flavor, use mild Cheddar. If you enjoy a more intense Cheddar flavor, use sharp Cheddar. Yukon gold potatoes have a waxy texture that holds up better than russet or baking potatoes, which tend to fall apart in the slow-cooking process.